At General Motors, they understand just how important mobility is if you have a disability. That's why they created the GM Mobility Program. It's designed to help people with disabilities access the resources they need, and get a reimbursement of up to $1,000 towards the cost of adapting an eligible GM vehicle*. First find a driver assessment facility and arrange for a complete evaluation. There are a number of facilities across the country, but if you're not sure where to find one, you can always get in touch with the Ministry of Transportation or contact us at the GM Mobility Program. Your assessment should include suggestions about your driving and a list of vehicle modification recommendations. If you already know what kind of adaptive equipment you need, you won't need an evaluation. Your equipment installer will only need a physician's authorization form. In most provinces, people are required to report any changes in their medical status to the Provincial Ministry of Transportation. When you report a change in your medical status, the Ministry may conduct a medical review, and may need to alter your driving privileges for your safety. Also keep in mind that failure to report a change in your medical status may put your driver's licence status in jeopardy all together. * Up to $1,000 (tax exclusive) credit available on an eligible new 2015, 2016 or 2017 MY Chevrolet, Buick, GMC or Cadillac delivered by January 3, 2017 to eligible customers. Only certain equipment and adaptations are acceptable for the credit under the program. Proof of eligibility must be provided upon request. GM Canada may modify or terminate program in whole or in part at any time without notice. See dealer for details. Get your driver assessment professional involved in the process. There is a broad range of vehicles and adaptive equipment available, but finding the right match can be challenging. Space limitations, vehicle use and the type of equipment you need are all factors you should consider when you're doing your research. What's more, the Express and Savana mobility vans offer amenities, options, and safety features that help make every outing more comfortable and secure. †† General Motors is not responsible for the safety or quality of design features, materials or workmanship of any alterations by such a supplier. Before you choose an adaptive equipment dealer in Alberta, shop around and ask about their qualifications, warranty, service practices and capabilities. Consider more than just the initial cost, and if you think it's necessary, ask the company for a list of references. If you're not sure where to find qualified installers in your area, the National Mobility Equipment Dealers Association (NMEDA), your provincial rehabilitation services agency and the Ministry of Transportation are good sources of information. Purchase financing is an instalment sale transaction between you and your dealer where you agree to pay the amount financed, plus an agreed-upon finance charge, over a period of time. Although leasing is only an option for certain vehicles, it lets you take advantage of a low initial down payment. Leasing also means you can drive a new vehicle more often without having to worry about resale or trade-in hassles. ¥ With leasing, the lessee does not own the vehicle. It must be returned to the GM Dealer at the end of the lease. The lessee may choose to purchase the vehicle for the Option to Purchase Price stated at lease signing. 1 Leased vehicles must have lessor's written approval prior to adapting vehicle. QHow can I make sure my vehicle is eligible? AFor the GM Mobility Reimbursement Program, in effect until January 3, 2014, you must purchase or lease1 a new and unused (not previously titled) 2012, 2013 or 2014 Chevrolet, Buick, GMC or Cadillac vehicle. 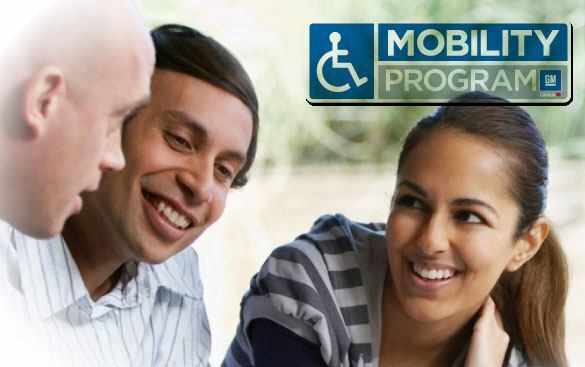 To confirm eligibility of your vehicle call the GM Mobility Assistance Centre at 1-800-GM-DRIVE (463-7483). You will need your Vehicle Identification Number (VIN). Confirmation of vehicle eligibility does not imply claim approval. QCan I use the reimbursement with other factory rebates and incentives? AYes. Speak to your Dealer about other offers available to you. QI don't see my adaptive equipment on your eligibility list. How do I find out if I can reimbursed? APlease feel free to contact us at the GM CANADA MOBILITY ASSISTANCE CENTRE: (800) GM-DRIVE (463-7483) English/French (TTY users, (800) 263-3830). QHow soon after I purchase or lease my new vehicle do I have to complete the equipment installation and apply for reimbursement? ATo take advantage of the GM Mobility Reimbursement Program, you must have the vehicle adapted and submit a claim within 6 months of the date of purchase/lease. Other program rules apply. QAre there any other ways I can offset the cost of purchasing adaptive equipment? AThe Canadian government does offer tax credits and rebate programs for some adaptive equipment. Contact your Provincial Ministry of Transportation for more information. QWhere can I find a qualified equipment installer? AIf you're not sure where to find qualified installers in your area, the National Mobility Equipment Dealers Association (NMEDA), your provincial rehabilitation services agency and the Ministry of Transportation are good sources of information. You can also use the NMEDA search tool to find an adaptive equipment dealer near you. QWhere can I get a driver evaluation? AThere are a number of facilities across the country, but if you're not sure where to find one, you can always get in touch with your local Ministry of Transportation or contact us at the GM Mobility Program at (800) GM-DRIVE (463-7483).